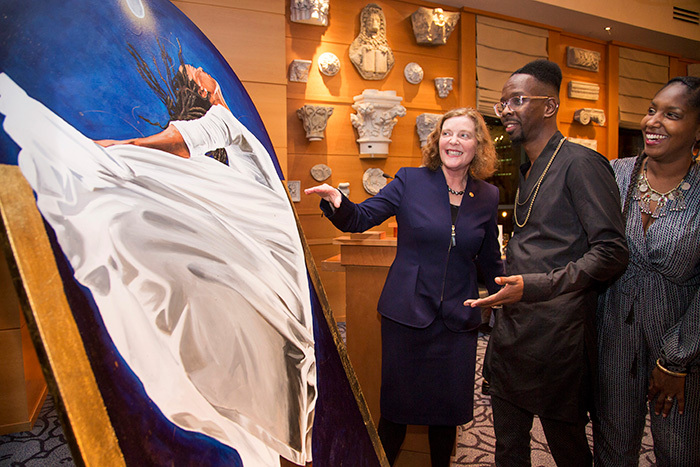 President Claire E. Sterk talks with artist and Emory PhD student Fahamu Pecou (center) about "Emerge," the painting he created to commemorate her inauguration, as his wife, Jamila Pecou, looks on. 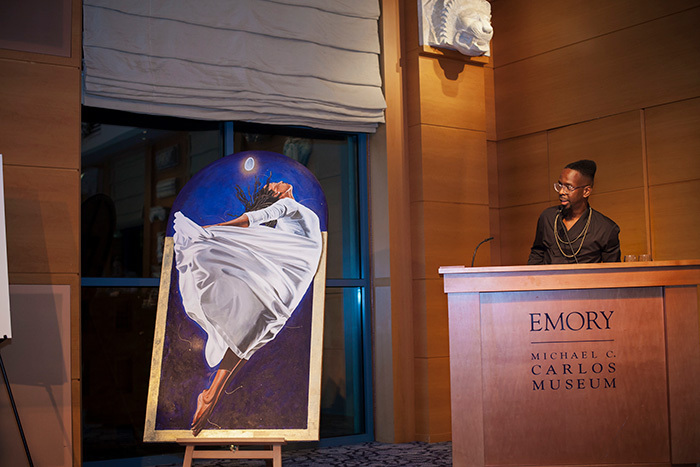 "As the Emory community embarks on a new dawn, I hope this piece will serve as a reminder and source of inspiration," Fahamu Pecou told the audience gathered for the unveiling of "Emerge." When Emory PhD student Fahamu Pecou was asked by the Emory Alumni Association to create a work of art commemorating the inauguration of President Claire E. Sterk, he approached the challenge as both an artist and a scholar. First, Pecou did his research, sitting down in conversation with Sterk to discover more about her life and work. The more he learned about the internationally acclaimed public health researcher and academic leader, the more he realized how much they had in common. “Though her work is rooted in the sciences and mine in the humanities, there was not very much difference in our approach,” observed Pecou, a fast-rising visual artist and scholar whose own bold work has been featured in private and public collections around the world. “She shares my passion for engaging with communities outside of the academy. Similarly, she shares a commitment to doing the work — to make meaningful and impactful contributions to society informed by in-depth scholarly inquiry,” he said. Next, Pecou dove into a deep exploration of Emory’s symbolism and iconography. Once his scholarly research was complete, the artist was moved to interpret. The resulting artwork, “Emerge,” was unveiled Tuesday night before an appreciative crowd at a reception hosted by the alumni association at the Michael C. Carlos Museum. The large acrylic painting depicts a female figure in a white gown rising off the ground, as if frozen mid-leap — an image inspired by “The Phoenix,” the name of one of Emory’s original student journals. And so the imagery of a phoenix, rising and reborn, would inform the painting. In the flowing folds of her gown, Pecou saw wings. Arms thrown back, toes pointed in takeoff, chin thrust triumphantly skyward, the figure projects a powerful sense of forward momentum — appropriate for the bold vision of Emory’s next president, Pecou thought. The final work also reflects Emory colors: The figure is set against a deep blue sky and bounded by a gold-leaf frame; above her floats a glowing golden egg, representing what is yet to come. Since then, his career has exploded, with exhibits in top international and national galleries, including the High Museum of Art and the Museum of Contemporary Art Georgia (MOCA), and public lectures and speaking engagements nationwide. Last year, one of Pecou’s paintings was acquired by the Smithsonian National Museum of African American Art and Culture in Washington, D.C. He’s also completing a series of large-scale art installations at four Atlanta MARTA stations. It was after establishing the foundations of a successful art career that Pecou found his way to graduate studies at Emory’s Institute of the Liberal Arts and Laney Graduate School, drawn by a yearning to be challenged in an intellectual environment. While at Emory, Pecou said he’s gained a deeper sense of purpose, both for himself and his artwork. Pecou emphasized that it is with pride and honor that he created the new artwork in celebration of Sterk’s vision. “As the Emory community embarks on a new dawn, I hope this piece will serve as a reminder and source of inspiration,” he said.